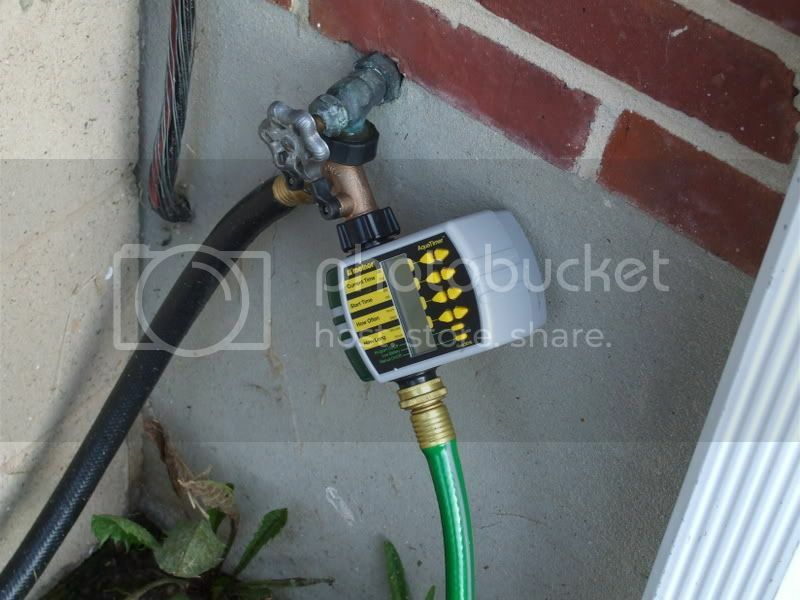 I have installed a water timer and a soaker hose for my vegetable garden. It runs once a day for 10 minutes at 7pm est. 1) Should I be running the hose twice a day or is once fine? 2)I have mulch in my garden, Can I leave the soaker hose burried under the mulch or should I move it to on top? Depending on rain, I don't run my soakers more than every 5 days once the seeds have been up for a few weeks but it would really depend on your soil. Mine drains quickly. On putting them under or over the mulch I don't think it makes much difference except if you need to relocate them, it's easier to have them above the mulch. I did let soakers lay below the mulch in flower beds of some commercial property I own. I didn't move the hoses for several years and when I retrieved them to use elswhere, the pores had clogged and they were useless. We have a large garden and I used 4 manifolds and 16 75' hoses. I had to tweak the location several times and was glad I had them above the mulch. I think it depends on how deeply your 10 minute watering is soaking in. I stick my finger in the soil as deep as I can and if it's starting to feel dry, then I water. When I do, I run the soaker hose for 30 minutes. (I have raised beds over clay -- this is going to depend on what kind of soil you have.) I've been watering every 3 or 4 days. This whole weekend, we had passing showers. Everything LOOKED wet and fresh, but when I did the finger test this morning, only the surface was wet -- it was dry underneath, so I watered. So of course, we had 1" rain this evening I tell my hubby, "I watered the garden so it's sure to rain later on!" Just as well since the rest of the garden that DOESN'T get watered had a nice drink. Oh, earlier on, when I was coddling transplants and seedlings, I was watering every day/every other day to maintain constant moisture nearer to the surface, but you want to encourage the roots to grow DEEPER in search of water rather than staying near the surface. Also, you need to water more when the hoses are above the mulch since the mulch will soak up some of the water and less will soak into the soil. applestar summed up most of my thoughts... good post there. Only thing I can add is that it is usually better to water in the morning than it is at night. Watering in the morning will not encourage mold or root rot, while watering at night can sometimes lead to either/both. thanks to all the replies! I have a compost, top soil and peat moss. I also have a layer of clay mixture that sits about 8 inches below. I have not noticed any mold as of yet but I was actually thinking about changing the schedule to be in the morning. Also I wanted to add that our days here are approx 90 degrees and the soil dries out pretty quick. I wanted to post some a picture of the timer I bought in case anyone else is looking for an affordable water time. Total = approx $50 for no hassle watering all season. All soaker hose is not created equal.